Pendal Group Limited (ASX: PDL, ‘Pendal’), the co-founder of Regnan – Governance Research & Engagement Pty Ltd (‘Regnan’), today confirmed it will acquire the remaining 50 per cent stake in Regnan to bring Pendal’s ownership to 100 per cent. Co-founder Commonwealth Superannuation Corporation (CSC) will cease to be a shareholder. Regnan is Australia’s leading provider of ESG research, engagement and advisory services. Regnan’s focus on environmental and social issues can be traced back to Monash University in the late ‘90s. Closer alignment with Regnan will support Pendal’s objectives to improve investor outcomes through a continued focus on stewardship. Further, making Regnan part of Pendal will enhance Regnan’s capability and service proposition to its clients by enabling it to leverage the fundamental insights of a highly regarded investment management organisation, across equities, fixed income and multi-asset portfolios. 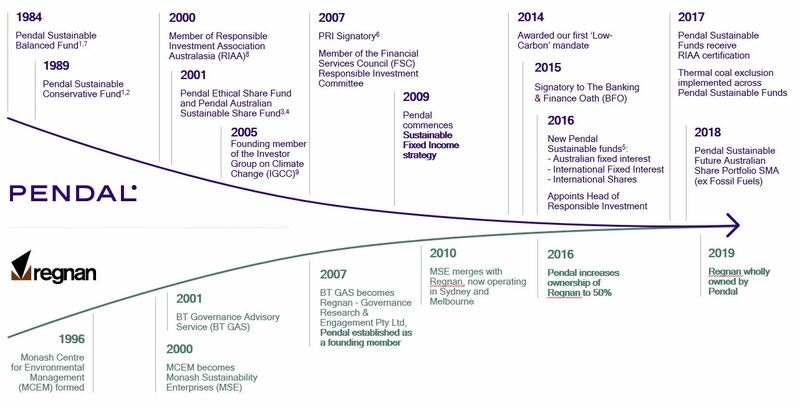 Pendal has a strong heritage in responsible investing, dating back to 1984 with the launch of the BT Australia Charities Trust*. Today Pendal manages approximately $2 billion in dedicated sustainable and ethical strategies on behalf of its clients. Regnan – Governance Research & Engagement was established to investigate and address ESG-related sources of risk and value for long term shareholders in Australian companies. Regnan has evolved to become a global leader in long term value, systemic risk analysis and responsible investment advisory. Regnan’s in-house team of experienced analysts produce rigorous, relevant ESG investment analysis. From this research and insight, the team tailors solutions to meet the specific needs of clients who include asset owners, fund managers, wealth managers, endowments, retail and investment banks. Clients use Regnan services for a range of purposes from stock selection, portfolio construction and stewardship, through to all aspects of responsible investment framework development and implementation. Regnan engage directly with leading ASX-listed companies, on behalf of its institutional investor clients, to drive improved ESG governance and long term thinking needed for stocks to yield higher quality returns. Regnan also advocates for ESG considerations to become mainstream through contribution to the public policy debate, board and committee-level participation in industry bodies, and submissions to government. * This fund was launched when the Pendal business was part of the Bankers Trust Australia Group. 1 This fund was launched when Pendal was part of the BT Financial Group. Pendal Fund Services Limited (previously known as BT Investment Management (Fund Services) Limited) became the responsible entity of this fund in 2007.